Victoria, BC, Canada – Reliable Controls Corporation is pleased to announce the official opening of the company’s new, operational office and training center in Singapore. 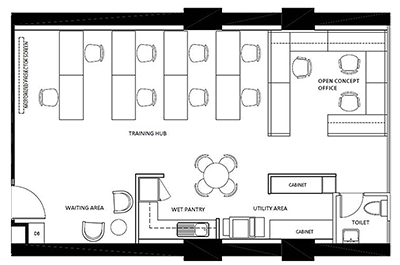 The space consists of a small waiting area, a kitchen, washroom, an office for three staff, and a training area for seven students and an instructor. Located at 81 UBI AVENUE 4 #08- 12 UB.ONE, SINGAPORE 408830, the new training facility is within walking distance to the Tai Seng Station (CC11) on the MRT Circle Line (orange) and conveniently located in close proximity to a variety of food courts. Reliable Controls is delighted to now have a base of operations in this part of the world, with expectations to expand the Reliable Controls Authorized Dealer network across Asia Pacific.